planet manners: USA: Urgent! Tell Obama to Stop Auctioning off Public Lands and Waters! USA: Urgent! 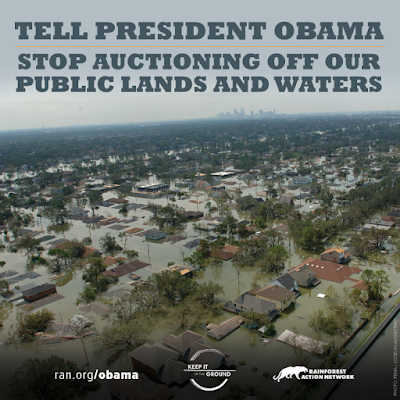 Tell Obama to Stop Auctioning off Public Lands and Waters! Subject: Tell Obama to Stop Auctioning off Public Lands and Waters! This month, we've seen historic, unprecedented flooding in the Gulf in what is being called a "1,000-year" event. Rivers and waterways have reached record levels. Homes and businesses have been submerged. Yet, as folks in Louisiana and Mississippi return to waterlogged houses and rebuild, President Obama has returned to climate-wrecking business as usual: just days after the flooding, the administration auctioned off an area the size of Virginia for yet more offshore drilling in the Gulf of Mexico. Climate change is real and getting worse. There is unprecedented flooding all across the Gulf, wildfires in the west, and record temperatures across the country. Something needs to be done — and you can help. Tell President Obama: Keep the fossil fuels in public lands and waters in the ground. So far, more than 60,000 homes have been damaged by the flooding in Louisiana, 13 people were killed, and the damage and destruction to Gulf communities is ongoing. Instead of addressing the root cause of this climate chaos, the Obama administration is helping the fossil fuel industry do more of what's causing climate change in the first place — drilling, fracking, mining public lands and waters for fossil fuels. On September 20, another lease sale for public lands is coming up — but this time, it will be held online. Why? Because people like you across the country have gathered together to take action and disrupt these auctions and stop these sweetheart deals for the oil and gas industry. By holding this next auction online, Obama is trying to silence our voices, and to make it easier for the wealthiest corporations to take public resources for their profit. Tell President Obama: "Stop auctioning off our public lands and waters for corporate profit!" Rainforest Action Network campaigns for the forests, their inhabitants and the natural systems that sustain life by transforming the global marketplace through education, grassroots organizing and peaceful direct action. Contributions to Rainforest Action Network are tax-deductible.